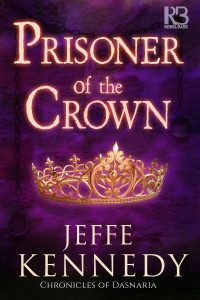 If you’re into Radish – which is an app for your mobile device – you can start reading PRISONER OF THE CROWN there immediately! The actual book will be out at all of the usual vendors on June 12, so you can order/preorder on your favorite platform. Because of this, I’ve been checking out Radish and it does look like a fun way to sample new-to-me authors. I’m not sure I’d want to read on it extensively, but for checking stuff out while I’m stuck somewhere as an alternative to scrolling social media? Win! But the man named as Jenna’s husband is no innocent to be cozened or prince to charm. He’s a monster in human form, and the horrors of life under his thumb are clear within moments of her wedding vows. If Jenna is to live, she must somehow break free—and for one born to a soft prison, the way to cold, hard freedom will be a dangerous path indeed . . .